There's a lot involved in figuring out what boot to get and knowing if you made a good choice. We'll start off listing the parts of boots, then various types of boots available, then discuss how to choose one, and finally a few pointers on using and caring for your boots. Sole - the bottom of the boot, responsible for gripping the ground, absorbing shock, and protecting from sharp objects. Soles should have deep patterns made of tough rubber so rubber highpoints will grip on hard, slippery surfaces while the entire sole will sink into softer surfaces, increasing the grip there. Soles need to be flexible to allow a natural gait, but also stiff enough to support the foot. Upper - everything above the sole. It's job is to snugly hold the sole to the foot and to protect the foot from scratches, twists, and pounding. It should repel water and allow perspiration to breathe out. The upper should be firmly and permanently attached to the sole - this is called the welt. Inner - Padding and linings are placed inside boots to increase comfort and help with moisture protection. Gore-Tex is a common water liner. Padding also provides insulation and reduces some pressure points. Padding in the toe or heel of your boot is a bad idea because it will quickly compress and change the fit of the boot. Insole - your foot stands on the insole and it should fit to your foot exactly for proper support. Foam insoles will quickly compress and lose support. Insoles with good arch support are important. Tongue - the cover for the opening where you insert your foot. A tongue allows you to adjust the snug fit of the boot. Scree Collar - around your ankle, there needs to be padding that keeps loose dirt, sand, pebbles out of your boot. This should fit snugly and can be helped along by wearing a pair of gaiters. Punched eyelets - usually reinforced with metal grommets, these are holes punched in the upper material. Tend to rip out. Webbing - loops of fabric, tend to wear out. D-rings - metal loops riveted to upper material. Very durable, but tend to cause pressure points. Hooks - open-backed riveted to the upper material. Often used for the top 3 or 4 eyelets. There is a wide range of footwear for hiking, ranging from going barefoot to mountaineering boots. The type of boot you require all depends on the type of hiking you are going to do, how much support you want, and how much you can pay - paying more does not necessarily mean getting a better boot. You may be better off with a less expensive, lighter boot for your hiking style. As examples of the general types of footwear, I've just used Merrell. I own a pair of $100 Merrell backpacking boots that fit me extremely well and have given great support for two summers. But, you can find similar styles of boot in higher and lower qualities from the various manufacturers - Asolo, Montrail, Salomon, Timberland, Vasque. Hiking Sandal - You can safely hike in sandals with sturdy tread and strong straps. A toe guard is a good safety feature to minimize toe stubbing - ouch! Sandals are very light so your legs work less to lift and step, but they have virtually no support for your ankle or foot. They are dry and comfortable for hiking on groomed trails with a light day pack, but not practical for any off-trail hiking or extended treks. It is a good idea to have a pair along on treks to use as a camp shoe and for water crossings. Find a sandal with molded arch supports, sewn rather than glued straps, comfortable footpad, and tough sole. The pictured style costs around $30, but I got mine on sale for $14. Hiking Shoe - Shoes provide comfort and easy hiking by using light materials such as nylon and suede enforced with some leather. They are very flexible and require minimum break-in time. You could probably buy a pair and start hiking in them the next day, after just wearing them around for a day. This shoe costs around $50, but there is a huge range in price and quality available. Unfortunately, this style has become popular for normal wear so there are many shoes that appear to be hiking shoes but have no support - check the specs. Real hiking shoes have good support for your arches and feet. They should also be designed to keep dirt and pebbles from getting in around the ankle and will preferably have some waterproofing. Their lower ankle cut lessens the support of ankles and provides no protection around the ankle area from brush and other scratches. I prefer to have a more sturdy feeling around my ankles when hiking, but these are fine for groomed trails. The sport of Trail Running is pretty popular and there are specific shoes for trail running that tend to be quite a bit more expensive. They include extra padding, a bit more support, and tougher soles. They cost more, but can be used for normal hiking too. 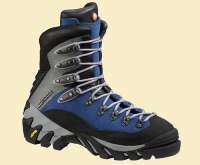 Mid-weight Boot - This is the boot that most hikers and backpackers will use. They are appropriate for on-trail and off-trail terrain that is not extremely rugged. Typically, mid-weight boots are made of leather or synthetic material with leather enforcement sections like the one pictured. You should expect to spend a week of walking to break in your boots; some require less time, depending on their stiffness. If you are not used to above ankle boots, you'll need to spend extra time getting comfortable to the feel. No matter what trails you plan to hike, a mid-weight boot will be a good choice. If you decide to go on extended treks, their extra foot stiffness and ankle support will help out. They also work fine on shorter hikes and give you the option to tackle more difficult routes if you want. The boot pictures costs around $80, but my pair of Merrells cost $140 and I got on sale for $95. Mid-weight hiking boots should be waterproof, probably with a lining of Gore-Tex. If you get an all-leather pair, you may treat it with waterproofing spray or paste. The extra boot weight means you will be working harder with these boots, but the extra safety and support are your rewards. Heavy Boot - If your lofty plans include boulder hopping and off-trail blazing, then a heavier boot may be in order. These boots bridge the gap between trail hiking and mountaineering and some have features of mountaineering boots, such as crampon lips. Heavy hiking boots offer maximum support against twists and foot injuries, plus being water resistant and breathable through the use of Gore-Tex liners. For general hiking, they are overkill, but for treks over rough trails with lots of elevation change, they may be a good choice. This sample pair runs about $150. The construction of heavy off-trail boots makes them more sturdy, but also more expensive and not so comfortable. You will need to spend a good amount of time breaking in your new boots and getting your feet used to hiking/climbing in them. They weigh more so you will be working harder for each step you take. Mountaineering Boot - Don't even think about getting a pair of these for hiking. :-) Mountaineering boots are intended for climbing mountains and are closer to ski boots than hiking boots. They offer extreme support for feet and ankles with attachment points for crampons for hiking on ice. Usually made with a hard outer shell, inflexible sole, and extra insulation, these boots would kill you on a day-hike. Using these boots, each step is deliberate and calculated - you climb up the mountain, you climb down the mountain. The boot here costs around $275. Boot Weight - the lighter boot, the less work for your legs. Get as light as you can and still keep the support you need. Water - You want materials that will let perspiration escape but not let water come in. Water in your boot is uncomfortable and causes smelly feet and blisters. Arch Support - keeping your foot comfortable and supported under load is important. If the boot lets your foot flatten out, it will result in a painful hike. Protection from Injury - stubbing your toe and twisting your ankle are the two big ones. Ankle support is more important the rougher the terrain becomes. Load Support - when you carry a load, the boot should protect your foot from bending too far forward or backward while still allowing an adequate range of motion. From my descriptions of the different hiking boot styles, you probably already know that I would always recommend a mid-weight boot. It is flexible and can be used for easy day hikes and extended backpacking treks. I also recommend taking along a pair of sandals on any multi-day hikes so you can air out your boots and let your feet relax when not actually hiking. This is important for drying out your boots for the next long hike. For basic day hikes, a hiking shoe would also be a good choice. If you are starting out, a shoe might be a bit more comfortable and you could wear it for every day walking. As long as you are staying on groomed trails that are not too rough, a shoe would be a good bet. But, for myself, I appreciate the ankle support and coverage offered by mid-weight boots so I have the option of stepping up my trail selection if I want. Type of Hiking - consider the terrain you will be walking on, the weather you will encounter, the length of your hikes, and the weight of your pack. A sturdier boot with more support is required for rougher, longer treks with a heavier load. A lighter shoe for groomed trails in arid country would be fine. Skill Level - more support is a good idea for a new hiker. Someone in good hiking shape with legs, ankles, and feet accustomed to the muscle use and pounding may use a lighter boot where a new hiker should have a sturdier boot until he improves his abilities and strength. Think ahead to where you plan to take your skill level. If you are starting on easy, flat trails but plan to work up to more difficult terrain later in the summer or next year, then plan ahead and get appropriate footwear now. Ignore shoe sizes. If you wear a 9, you may go to 10 or 8 in a hiking boot. Concentrate on the fit of the boot, not the supposed size of it. Wear your exact hiking socks when trying on boots. Use a sock liner if that is what you plan on hiking in. Boots should feel snug all over, but not tight. There should be no points of pressure. Shop for boots in the afternoon or evening. Walk around the mall in your shoes for 10 minutes before trying on the boots. Your feet change in shape through the day and this will help prevent buying boots that seemed to fit. Unfasten the laces and put your foot in the boot. While standing, push your foot forward until your toes reach the toe of the boot. There should be just enough room for you to slip your index finger between your heel and the back of the boot. Check both feet. Move you foot back to the rear of the boot and lace the boots up snugly. Walk around a bit to see how the boots feel. Your toes should not touch the front of the boot. If you kick your toe into the floor, the front of your ankle and top of your foot should take the force - your toes should not hit the toe of the boot. If your toes hit, that means you will be constantly pounding your toes when hiking downhill and it will become painful. Your heel should not slip in the boot. Hold the heel of the boot down with the toe of your other boot and try to lift your heel. If it moves up and down more than a quarter inch or so, then when you hike you run the risk of rubbing a nice big blister on that heel. You may try a smaller size or look for a different style with a different heel cup and arch form. Boot Quality - I'm not really much of a brand-name kind of guy. I also have this suspicion that the sales guy is going to push me to the most expensive boot instead of the best boot for my needs. I've had Nikes that disintegrated and I've had Wal-Mart items that never wear out. But, in general, you pay more for higher quality, I'll go along with that. In the world of hiking boots, there are some major players and they have tough customers. Turn out a poor product and folks will try a different brand the next time around since there are so many to choose from. Stitching - look for missed stitches, loose threads, neatness. Welt - where the upper and sole are connected. should be tight and no spots that look weak or loose. Thin Spots - even leather thickness, no abrasions, no cuts or uneven edges. Tread - thick, tough, and solid. not spongy and soft to wear out in a few weeks. Lacing - braided nylon rather than flat shoe laces. Check eyelets for strength and durability. Smell - seriously! I smelled a pair and it was like dead fish. It should have a clean, new leather smell. Depending on the materials used in the construction of your boot, you will need to use different products to care for them. Make sure you ask the salesperson or manufacturer for proper care procedures. Break in your new boots. Lighter boots need little break-in, but make sure you wear them around the neighborhood at least a few times, until your feet feel comfortable in them. Store your boots in a cool, dry place. Put crumpled up newspaper in them to absorb moisture. Take them out and wear them every month or so just to keep them soft and in the correct shape. Make sure you have new, strong laces in your boots before starting a hike. Nothing like having a broken lace out there. Just tie a knot and carry on if it does happen. Never dry your boots by a fire or other source of high heat. High heat may destroy glue, ruins leather, and makes you spend more on another pair. Dry them gradually in warm, dry air. After a trip, clean and thoroughly dry your boots. Treat them with the recommended conditioner, usually oil or wax for leather and silicon-based for synthetic materials. Before a trip, coat them again with conditioner and coat the seams to improve water resistance. Shirley - There are many brands that work great but each person has a 'best' shoe based on weight, support, feel, cost, and availability. You have to try on a bunch of different brands and styles until ou find what works for you. Some brands are Keen, Asolo, Danner, Teva, Salomon, Merrell, New Balance, Lowa, Scarpa. Feb 14, 2013 - ShirleyM. Great site, congratulations. I've been day hiking for years and FINALLY found a pair of boots that didn't beat up my feet. Merrell and Scarpa were either too loose or too narrow and I always had to use moleskin to prevent blisters. Someone in my hiking group turned me on to Ecco (from Denmark). Not cheap, but what a difference! The first hike with them on, I was singing their praises. For first-time and even experienced hikers, it can occasionally be hard to find the "right" boot. You're right, one really must try on a lot of different makes & models to see the difference in fit, preferably at a store (or stores) where the sales staff practice the sport and so can help properly fit the boot/shoe. Bad fit = miserable hiking. I guide in the Rocky Mountains of Colorado over the Summer. I definitely prefer hiking in my sandals (chaco Z2's) as long as it's a trail I've known and done before. I've hiked all the way up to 14,000+ ft in them through boulder fields as well, although that took time to build up foot toughness. If I'm hiking a trail I've never done before I prefer a low cut shoe, like trailrunners (My Merrels and 5.10's are both great). Wear whatever you feel comfortable hiking in. Just came back from a 28.8 mile hike on the AT in NJ ... rocks, rocks & more rocks. The front of my toes were killing me by the end of the hike. I see you say they should not hit the front of the boot on downhills. I am assuming that means the boots are too small? They fit fine in the width and felt great otherwise. All of your information is very helpful! Thank you! Our family is going on our first trip to Yosemite this June. We plan to do lots of hiking. We all have new hiking boots. My question is my brother in law who has been to Yosemite a couple of times says that we need inserts for out boots. What is your opinion on inserts? @Bobbi - I don't use them, but many people do. I see them as an extra expense that I've not needed. Great advise! I have a 15 year old daughter heading out to Cloud Peak "Head out to the Bighorn Mountains of North Dentral Wyoming with Camp Manitou to develop route planning, trail cooking, leadership and backpacking skills as we expedition to the summit of Cloud Peak, the tallest mountain East of the Rockies. Trippers will excursion with camp through the Black Hills of South Dakota before entering the Cloud Peak Wilderness Area at Ten Sleep, Wyoming. Trippers will be taught all the necessary skills for safe and successful backpacking in the backcountry during eight days on trail, four of which will be spent at Misty Moon Basecamp in the shadow of Cloud Peak. Trippers should expect traveling distances between eight and ten miles per day with elevation gains up to 1,000 feet." for her hiking experience with the Eau Claire, WI YMCA. From the discription above would you suggest midweight or heavy weight boots. They leave in 2 months so i want her to break them in. @Tommi - midweight. The only rough trail she'll find in Cloud Peak Wilderness is the day climb to the summit and back. The rest is all highly-used trail. What is the brand hiking sandal pictured? @Angela - That's an old "Columbia" sandal I had. There are many brands of sandals available for hiking. My wife and I hike in fairly steep terrain regularly (6,000 to 8,000 feet, 20 to 30 miles per week). She's been using her running shoes (soft sole) and has managed to twist her right ankle three times in the last three weeks. I have recommended she go to an ankle height hiking boot, but she states she does not like anything on her ankle. Suggestions? I need solid advice to get her out of her running shoes, if that is appropriate. @Ken - It's been my experience that ankle injuries come about from going too fast or not watching foot position on rough trails. I use trail shoes all the time on my long hikes, but use boots on cross-country or very rocky areas. Her lower leg muscles may not be as strong as they used to be, resulting in aggressive steps being too much force to absorb. Slowing down, being more careful with foot placement, and getting more ankle support are all things that could help. Thanks. More ankle support may be the key, but how? Her muscle tone is are good, but it is still building. You have a suggestion or two for additional ankle support? We bought her hiking poles and those have helped quite a bit. The areas we hike vary from well beaten trail to mountain goat track. The grandness of the scenery tends to distract both of us and that may be having an impact on foot placement. For all your fans, Cascade Canyon to Solitude in the Grand Tetons is truly spectacular. Beginning is steep, the rest is pretty easy though it is a very steady climb to 9000 feet. Paint Brush trail is in the plan (10,700 feet +/-). She needs solid ankles, so any help will be greatly appreciated. @Bart - I prefer lighter trail shoes and very seldom wear boots. I've tried the five finger shoes but my feet did not fit their form. Heavy-tread boots don't really provide any benefits over lighter shoes for most people, regardless of the hike length. The only time they make sense to me is off trail in very rugged terrain or in mountaineering. If you have been wearing boots and relying on their stiff support, don't suddenly change to lightweight shoes for a long trek. Practice short distances in shoes to work your leg and ankle muscles, and get used to how they feel while carrying a pack. Aug 28, 2014 - Susan V.
Howdy! I love your site. I work at a sporting goods store during the day and pound the concrete floor there at least 6 miles each day. On my days off I hike. I recently bought a pair of Keen Targhee II Hiking shoes to wear to work since my feet were in so much pain by the end of the day wearing sneakers. I will be wearing the same shoes hiking. Do you think that I will encounter a problem when I hike in the same shoes? Forgot to mention that I am a size 8.5 with a high arch and when I tried the size 9s on my heel slipped right out of the shoe. These 8.5s are right to size. I know that sometimes a half size is better with these type of Keen hiking shoes. @Susan - I've really enjoyed Keen sandals, Pyrenees boots, and shoes. I don't see any reason why those shoes you enjoy wearing all day won't work just fine on the trail. They should be conformed with your feet and more comfortable than switching to some other shoe. Maybe just put on dry socks before starting your hike. The best pair i have had so far is the mindle soft line gtx. Great info! I am new at hiking and just bought my first pair of boots. I keep getting blisters on my little toes. This leads me to believe my shoes are too narrow and must be pinching my toes. Do you think this could be an issue of their not properly broken in? Or maybe there is some way I could widen them? Any advice would be great before I chuck them out for some new ones. @Maria - Hard to tell. I've got a pair of trail shoes that cause pain in my right little toe. It feels like a blister, but there is nothing there. Investigating more showed me that there was a stitch in the shoe at that exact spot that was irritating the toe. I put a piece of duct tape over that stitch on the inside and no more irritation. Wearing liner socks and cushioning socks might help you. Wearing the boots for shorter walks until your feet are used to them and toughened up a bit on the toe might do it. Or, they might just be a bad fit. love my walking sandles, cant get over how good they are! there AWESOME!!!! For those people that plan to hike the Grand Canyon. Just info you that mules are used along the trail daily to transport people or supplies to the bottom and back on South Kaibab trail and to Indian Springs via Bright Angel trail. Which means a lot of mule waste on the trails. It's a softer hike on your feet, but personally, I don't think sandals is something I'd consider on those trails. Just something you may want to know, for what it's worth. Hello, My husband and I are new to the hiking world and we each just purchased hiking boots from REI. Mine are the La Sportiva model they recommended to fully support my bad ankles (one still needs surgery), and my husband's are Patagonia. Both of us feel that our boots are very comfortable. However, after a 45-60 minute walk in the neighborhood on concrete, my back really started to hurt & still bothers me a day later. Also my hips and knee are a bit sore. My husband also feels some back pain. We realize that breaking them in on a trail is preferable, but we won't be able to get to a trail often enough to break them in in 4 months for an off the grid trip to Israel. We both used the stock insoles, but I do have a pair of blue Superfeet to try out. It doesn't seem like I should have back pain after 1 walk on concrete but I don't know. Usually my ankles are a huge problem, but they feel great and now my back hurts! Help! Any input would be appreciated! We do quite a bit of hiking living near the Smokey Mountains. I've always worn my running shoes. After the last hike, I felt some discomfort in my L arch. I'm just starting to look into some hikers. In the past, I had some trouble with my achilles tendon, so I'm hesitant to wear anything rigid or confining for my ankle like a mid or high top. It seems it would inhibit the flexing of the foot and cause undo stress. What would be your recommendation? Is there a shoe that is known to support the foot yet gives flexibility? @Debbie and @Stevie - Back, hip, knee, and other joint pain really should be discussed with your doctor, not with a website. An hour-long initial walk in new shoes can definitely cause discomfort to your body, especially if you've been sedentary. Most long distance hikers wear trail shoes to reduce weight and fatigue. If leg muscles are in shape, then high ankle support is usually not necessary. Great site! I'm a dad, run marathons, day hike trails w my teens in trail runners. We are heading to Bernese Oberland / Swiss Alps and will do a few days of hut-to-hut hiking. Anyone here know that area? Can I do it in trail runners (Brooks Adren ASR GTX), which is my preference, or do I need boots? Thx! @TG - Any European trail with huts is pretty well-used and trail shoes, rather than boots, should be just fine. Besides, you are used to using them already, not making a change to them just for this trek. Hey Hiker Dude- great info. I've been hiking the past few seasons on Merrill Siren Sport shoe and have loved them. Time for an upgrade and this season and I'm going longer distances and trickier terrain. Nothing crazy- still day hikes, and my pack is under 20 lbs. I'm definitely experiencing big foot fatigue in my Merrills now, even in the middle of my hikes. REI is recommending getting out of the shoe and into the midrise. I'm looking at the Lowa. Any thoughts? Thanks! @karen - My recommendation: He should follow his doctor's advice. It sounds like he is already coping with his injury and it is not keeping him from running. I expect the same care while hiking would work just as well for him. REI, Cabela's, Gander Mountain, and many other outdoors gear stores carry many good brands and styles of boot and shoe - Keen, Merrell, Vasque, Lowa, Salomon, Teva, Patagonia, Scarpa, ... - it's a seemingly infinite list. What fits my foot and is comfortable to me might not be the same for someone else. The only way he can get a new shoe that works for him is to try some on until he finds one. Have tried lots of boots but haven't been able to avoid getting toes beat up going downhill. Any advice on brands that could address this problem .. or anything that comes to mind. Thanks so much. 1. Lace the shoes tighter so the top front of your foot and ankle press against the show tongue when going downhill instead of your foot slipping into the toebox. 2. Get a shoe with a wider, larger toebox so the toes are not crushed. Maybe supplement that with thicker socks. Some outdoors stores (like REI) have helpful, experienced footwear folks and realistic test ramps where you can try out shoes. Unfortunately I am a plantar fasciitis sufferer. The recommendations I found called for a stiff boot when carrying a load (backpack) so I went all the way, stiff boot with a moldable insert from Red Wing Boots. The boots are leather and heavy, and I had to practice hike quite a bit to build up the muscle to use them. It all paid off, a week long hike with no fasciitis pain. I also took a couple of missteps that I would have rolled my ankle in a shoe but with the support of a heavier boot, nothing happened. I am a picky shopper and tried on many many pairs until I settled. I don't drop over $100 with abandon so it was a tough choice. My advise if I am allowed to give it would be to spend much time picking your boots/shoes, your feet deserve it. I'm a novice hiker and I just bought new boots. The length is great and the right boot fits like a charm, but my left boot has a pressure point on the top of my foot, over the arch. I've tried skipping a set of eyelets -- is there something else to take the pressure off this one spot? Do I just need to wear it in more? @Jane - It sounds like you've researched the problem already and tried some things. You could lay a piece of fluffy fabric like fleece or wool on top of your foot before lacing your boots. If the boots are new and stiff, they may feel better as your feet get used to them and they loosen up. Good to know about taking out the boots and wearing them once a month. I do go many months without wearing them for hiking. I remove the manufacture insoles and replace them with Superfeet insoles. Makes a big different. Changing the lacing also improves on comfort for my feet. Thanks for all of this great advice. Do you have any recommendations for foot wear for hiking on a lot of scree and boulders. My current boots are very stiff and I seem to slide around a lot. Thanks. @Diane - Softer, grippy soles could be helpful on rock, but I know of no way to not slide in scree.